The main wires are manufactured into a flattened profile to enable the product to be easily installed on to a mortar bed without steel build-up problems at lap positions and corners/ junctions, or when used in conjunction with wall ties. 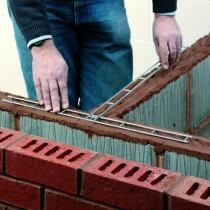 Brickforce is available in a range of different wire diameters for specific structural loading situations and in a variety of product widths to suit different block or brick leaf construction. Manufactured from either stainless steel, for use in external solid or cavity walls, or galvanised steel, for use in dry internal walls.